BoardSource (either “we” or “us”) are committed to protecting the privacy of all users of our online services. The following discloses our policy for gathering and disseminating information for this Web site located at www.standforyourmission.org (the “Site”). If you have any questions about your rights as a user of this Site, you may contact BoardSource. Certain parts of this policy are applicable to individuals who provide their personal information (including name and email address), while other parts apply to those who do not provide any personal information. We collect two types of information about you when you visit the Site: personal information (such as, your name, address, telephone number, e-mail address, and credit card number), and non-personal, aggregate information (such as information regarding the pages on our Site you have visited and your IP address). The only personally identifying information that we collect and store about you is the information that you have chosen to provide to us. For example, if you choose to sign in using to the Site, we will collect your name, address, E-mail address and other personal information. Further, if you make a purchase from the Site, we will collect your name, address, credit card number and other personal information in order to fulfill your order. We also may collect your personal information when you contact us via the Site. This information is commonly collected by Web sites. It is only used to help us make our site more useful for you. With this data we learn about the number of visitors to our Site and the types of technology our visitors use. Some parts of this Web site may use a “cookie.” A cookie is a small amount of data that is sent to your browser from a Web site’s computers and stored on your computer’s hard drive. It often includes an anonymous unique identifier. There are two types of cookies: non-persistent and persistent cookies. A non-persistent cookie enables a Web site to temporarily store information on your computer as you travel from one page to another. This cookie is automatically deleted from your machine when you close your browser. The Site uses non-persistent cookies to help track items put in your shopping cart and to allow a member to remain logged in as they move among Web pages. BoardSource uses a persistent cookie if you select the “Remember me on this computer” option when logging in so that you do not have to re-enter your User ID and password on subsequent Site visits. BoardSource also, on an anonymous basis, uses persistent cookies to help track the number of times a person visits the Site. We collect information through “referrers,” IP addresses, and various environmental variables. A “referrer” is information the web browser passes along to the www.standforyourmission.org web server that references the URL from which you came. An “IP Address” is a number used by computers on a network to identify your computer so that data can be transmitted to you. An “environmental variable” may include but is not limited to the domain from which you access the Internet, the time you accessed the web site, the type of web browser and operating system or platform used, the Internet address or the web site you left to visit the Site, the pages you visit while at the Site and the Internet address of the web site you then visit. We may collect IP address information in order to administer the web site and to gather broad demographic information. We also collect information through Google Analytics Advertising Features, including Demographics & Interests reports. Google Analytics is a web analysis service provided by Google. 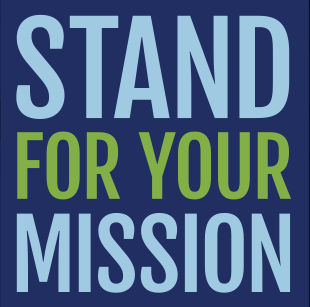 Google utilizes the data collected to track and examine the use of www.standforyourmission.org to prepare reports on its activities and share them with other Google services. Google may use the data collected to contextualize and personalize the ads of its own advertising network. We use this information to track age, gender, parental status, and interests of the visitors to the Site to better understand our audience and customize our website to meet the needs of our audience. We may share personally identifiable information with any affiliates, partners, agents, or other parties whose products and services may be of interest to you. If you do not want us to share your information in this manner, please see the “CHOICE” section below. We may also share personally and non-personally identifiable information with third parties in order to fulfill a request or otherwise complete a service. In the unlikely event that all or substantially all of our assets are sold or transferred to another party, we may transfer personally identifiable information to the acquiring entity. We also reserve the right to disclose personal and non-personal information if we reasonably believe we are required to do so by law; to protect ourselves or to protect the rights of another user; to reduce the risk of credit or other kind of fraud; or to comply with a court order. You may set your browser not to accept cookies, or to warn you when a cookie is being placed on your computer. If you choose not to accept cookies, however, your ability to navigate this web site may be hindered and you will not be able to use our online shopping cart. You may access the personal information we have collected about you and correct any inaccuracies. Please contact us by E-mail at privacy@boardsource.org or by contacting us at the following address: Attn: Customer Relations, BoardSource, 750 9th Street NW, Suite 650, Washington, DC 20001-4590. If you do not want us to share your information, please send an e-mail to privacy@boardsource.org. If you have any questions about the security of our web site, please contact privacy@boardsource.org. The information contained on the Site is provided for general informational purposes only. None of this information is intended or should be construed to be legal advice or a legal opinion. Although reasonable effort is made to ensure that the information contained on the Site is as accurate as possible, omissions and errors may occur and the information may not reflect the most current developments. BoardSource expressly disclaims all liability to any person with respect to the consequences of any act or omission committed based upon reliance, in whole or in part, on any of the contents of the website. If you have any questions about this privacy statement, the practices of BoardSource or its online service, or any other aspects of this Site, please contact privacy@boardsource.org or call our Communications department between 9:00 a.m. and 5:00 p.m. Monday – Friday, Eastern Standard Time at 877-892-6273. We do not sell products or services to children under the age of 13, and we do not knowingly collect personally identifiable information from any child under the age of 13 without parental consent. When we receive such information, we delete it as soon as we discover it and do not use it or share it with third parties.